On Feb. 23, the very day the NH Center for Public Policy Studies announced it was shutting its doors, the state’s only remaining think tank — the NH Fiscal Policy Institute — welcomed nearly 150 people to the Grappone Conference Center in Concord for its fifth annual conference. With the theme of “Building a Strong Foundation for a Prosperous Economy,” the conference opened with an economic, demographic and fiscal profile of the state, followed by presentations on building human capital through health and education and physical capital through housing and transportation. “New Hampshire is a state full of contrasts,” observed Evelyn Aissa, executive director of Reaching Higher NH, which promotes high standards for public schools. Her remark struck a recurrent chord sounded throughout the morning, as speakers addressed the challenges facing those seeking a greater share of the prosperity that has afforded the state the highest median household income in the country. Phil Sletten, policy analyst at the institute, noted that, at 7.3 percent — about 94,000 people — the poverty rate in New Hampshire is the lowest in the U.S. 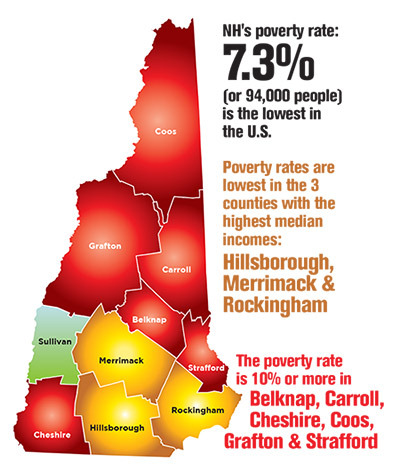 In six of the 10 counties — Belknap, Carroll, Cheshire, Coos, Grafton and Strafford — the poverty rate is 10 percent or more, while the rates are lowest in the three counties with the highest median incomes — Hillsborough, Merrimack and Rockingham. He said that while employment has recovered since the recession, driving the unemployment rate below 3 percent, the sectors generating the largest share of jobs — health care, social assistance, administrative services and hospitality — are those paying relatively low wages and salaries. Barbara Couch of Hypertherm Inc. in Hanover, where she is vice president of corporate social responsibility, and chair of the Hypertherm Hope Foundation, set the tone in her keynote speech. Noting that earning high incomes and living near work go hand-in-hand, she said that for many employees the average commute to and from their job is 50 miles, and almost a quarter of every dollar they don’t spent on rent they spend in transportation. Likewise, she said that, in the Upper Valley, child care may cost a fifth of an employee’s earnings, compared to the national average of 7 percent. She described the costs of reliable transportation and child care as “barriers” to recruiting employees while young families struggle to overcome the dearth of affordable housing. Aissa mentioned that U.S. News and World Report ranked New Hampshire’s K-12 education system tops in the country. The graduation rate of 88 percent is above the 84 percent national average — the highest among the New England states and trending upward. On the National Assessment of Educational Progress, the state’s fourth and eighth graders have consistently scored among the top ten for both mathematics and reading. But, turning to the contrasts, Aissa said that some 44,000 students, or more than a quarter of the total enrollment in public schools, qualify for free and reduced price lunch as members of a household with income of 185 percent of poverty, or $44,000 for a family of four. Their graduation rate is 76 percent, less than that of their peers in New England. Their dropout rate is 11.8 percent, compared to the 2 percent of other students. To highlight the disparities, she drew a comparison between two school districts: Bow and Franklin. In Bow, where the median income is $102,000 and half the adults hold college degrees, there are 1,605 students, only 6 percent of whom qualify for free and reduced priced lunch. Students in Bow score grade levels two times above the national average and 95 percent of them graduate. In Franklin, where the median income is $43,000 and less than a fifth of adults hold college degrees, there are 1,089 students. Some 58 percent of them qualified for free and reduced priced lunch. These students score grade levels below the national average and three-quarters of them graduate. Stressing that test scores measure performance, not intelligence, Aissa said that socioeconomic disparities affect educational achievement. “The higher the income and economic security, the higher overall student achievement,” she said. It was a conclusion seconded by Brendan Minnihan, superintendent of the Laconia School District, where he noted the poverty rate is 17.5 percent, more than half the students receive free or reduced price lunch and others receive breakfast and dinner as well. As enrollments have declined by some 25,000 students, or 12 percent, during the past decade, state aid to local school districts has also shrunk, slipping by almost $200 million since 2010, and it’s expected to continue to decrease by another 7 percent over the next five years. At the other end of the educational spectrum, Charles Ansell, chief financial officer of the Community College System of New Hampshire, said that 77 percent of those earning certificates and degrees are employed in New Hampshire, with the highest-paid graduates earning starting salaries between $30,000 and $53,000. “We are the engine for the middle class in New Hampshire,” he said. Ansell explained that the system, in partnership with the University System of New Hampshire, is pursuing the goal of ensuring that 65 percent of residents 25 and older earn certificates or advanced degrees by 2025. Lucy Hodder, director of the health law and public policy programs at the University of New Hampshire School of Law, said that, with the expansion of Medicaid, 94 percent of the state’s population now carries health insurance, 60 percent through their employers, 14 percent through Medicare and 10 percent through Medicaid. Children account for about half the more than 180,000 enrolled in Medicaid. However, she said, federal funding, which met the entire cost of expanding Medicaid, is “tapering off,” raising any number of questions about the future of the program. Community hospitals, especially those serving rural areas with disproportionate shares of Medicare and Medicaid patients, are already operating under significant financial pressures, Hodder noted. At the same time, Lisa Bujno, assistant medical director at Littleton-based Ammonoosuc Community Health Services, said that community health centers, which provide primary preventive healthcare to adults and children irrespective of their means, are also at risk from reductions in federal funding. She noted that the centers are especially important elements of the health care system in the more rural parts of the state, poorly served by major highways and public transportation. “The numbers speak for themselves,” said Dean Christon, executive director of the NH Housing Finance Authority. “We’re not building enough houses. It’s as simple as that.” Permits and construction of single and multifamily units remain at half the level of 2007 just before the recession began with the highest-cost markets in the southern tier and Seacoast accounting for the only marked increases. Listings of homes for sale have fallen since 2010 and the number of homes listed at less than $300,000 has declined by 50 percent, as the median sales price has risen to $260,000. Likewise, the vacancy rate for rental units has dropped to 1.7 percent, compared to the national rate of 7.3 percent and the regional rate of 5.2 percent while the median rent for a two-bedroom apartment has climbed 14 percent in last five years, to $1,259. The highest rents are in Hillsborough, Rockingham, Merrimack and Strafford counties, where nearly 80 percent of all rental units and 60 percent of all jobs are located. Noting that “private investment drives the housing market,” Christon said that “changes in regulatory philosophy” are required to incentivize developers. He said that the permitting processes and zoning regulations can prolong construction and increase the cost of housing projects. Moreover, he explained that the housing stock fails to match the growing demand of older residents for smaller dwelling units and the financial resources of first-time buyers for more affordable homes. Communities, Christon suggested, should reconsider their approach to development to foster more diverse types of housing. The conference, she added, served its purpose. She reminded those who were unable to attend that the presentations are posted on the institute’s website at http://nhfpi.org/news-events/policy-conference-2018.